The School of Indigenous Studies is proud to present Boodjar: Nyungar placenames in the South-West. Boodjar (Country) is an interactive cultural mapping of the South-West of Western Australia, covering the general area south of Geraldton and west of Nungarin and Esperance. 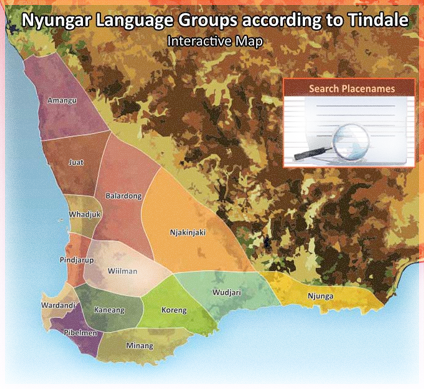 Professor Len Collard, Chief Investigator at the School of Indigenous Studies, and his research team spent three years investigating the historical meanings of Nyungar placenames in the area prior to colonial settlement. The mapping sheds light on how Nyungar people lived in Boodjar for many thousands of years. It brings to life ceremonies performed in some places and meals shared in others, the ochre trade, wildlife, weather conditions, friendships, magic, spirits and other practices central to Nyungar culture. We hope you enjoy discovering the meanings of your favourite places in Nyungar Boodjar.The research for this project was supported under the Australian Research Council's Discovery Indigenous Researchers Development funding scheme.